I’m sure this moto looks familiar to you all, since pretty much every blogger out there posted it during the Nordstrom sale this summer. I’ll admit, I got caught up in the hype and ordered it too, and I’m so happy I did! It really is so luxe and this color is just divine. And speaking of colors, holy cow they have added so many new ones! I just bought the lavender one and can’t wait to style it for spring. 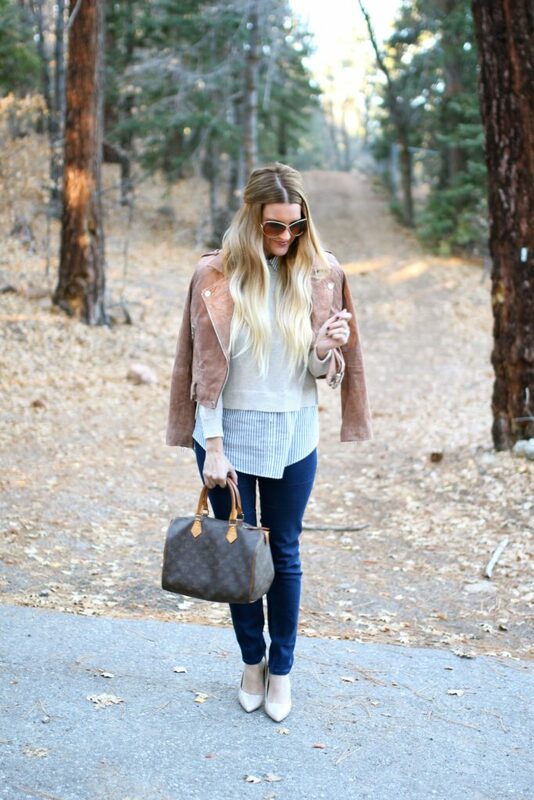 Love this look and that jacket is such a great closet staple. Have a wonderful Thanksgiving!! I love the colour palette of your outfit and of course..that jacket. Oh my, it is divine. Gorgeous look and photos Shauna! Have a happy Monday! Gorgeous layers, lady! That suede jacket is a standout! Good Morning angel!! I so wish I’d have gotten that moto!!! You look fantastic and soooo classy!! Happy Thanksgiving to you and your family! You will be the pretty girl at Turkey day!! Hugs to you beautiful friend!! Cute outfit! Love that jacket! I can’t stop wearing my suede jacket–it’s SO perfect for this time of year! Love how you styled and layered yours! I’m in love with this look and the layers! Have a wonderful Thanksgiving!! So cute, Shauna! I love this jacket too. I never bought it and I’m so regretting it! I hope you have a wonderful Thanksgiving! Can’t wait for all the holiday looks! OMG I FREAKING LOVE THIS! Such a great jacket! I love the color and the cut of it! I love your jacket!! Have an amazing Thanksgiving! 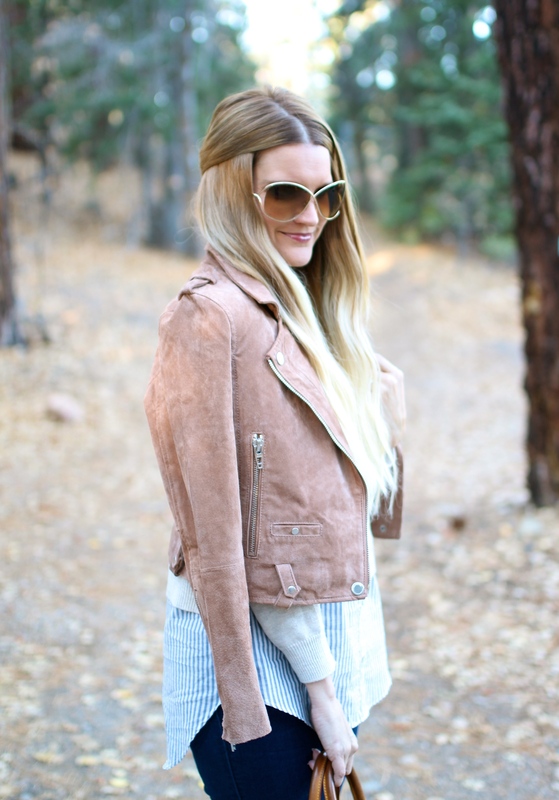 The color of this suede jacket is everything!! 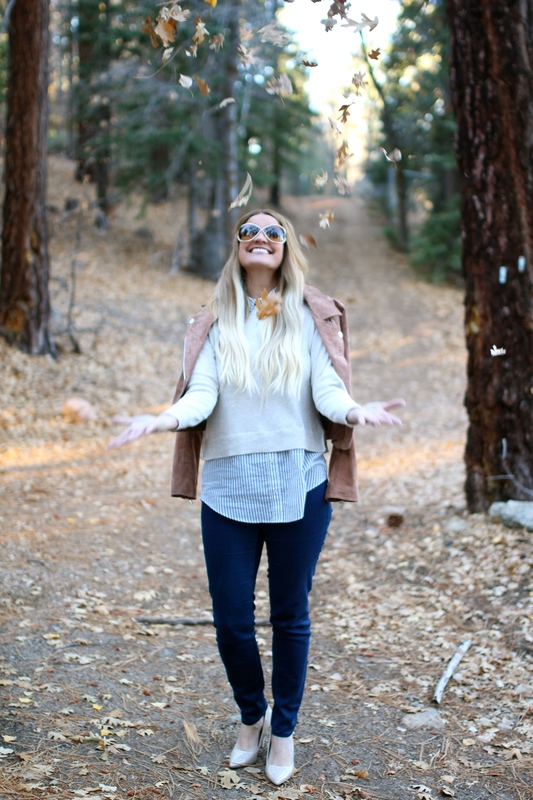 Perfect fall styling babe! I love this outfit so much especially your jacket! This must be the most gorgeous moto jacket ever! I’m obsessed! Such a beautiful post and look my dear Shauna! You look amazing! 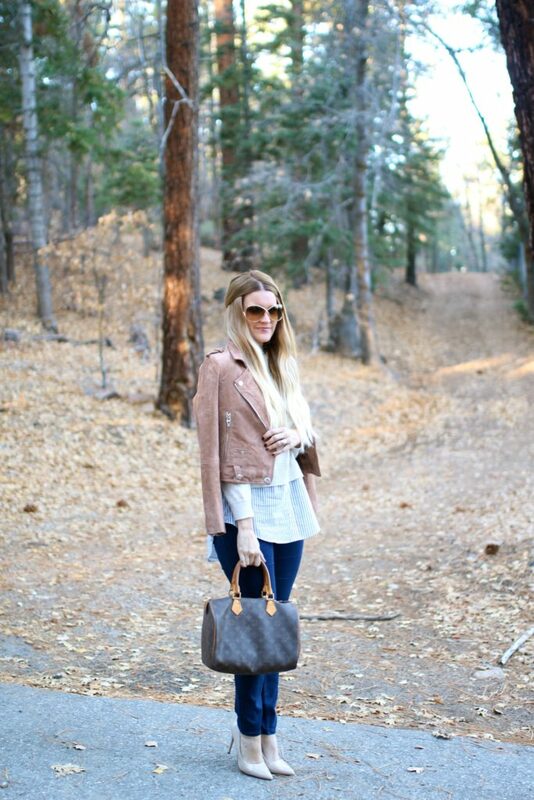 Love the layering and suede jacket, and this last photo with you playing with the leaves is so awesome! Have a great day babe! Oh, how lovely you look! I love the short sweater on top of the shirt, it looks great! And the jacket is so beautiful, I love suede, it feels luxurious in a way. This jacket is SOOOOO on my Christmas list! I love it! That jacket looks great. I love the suede. Good God you look Gorgeous Shauna! I am obsessed with that jacket, and every time I have gone to get it, it has been sold out. 🙁 Beautiful as always! Ahhhh I’m obsessed with that jacket!!! LOVE LOVE LOVE!!! I want it for christmas haha!! Way too cute! I love H&M and it’s so cool to see how you put these pieces together. That jacket is just fabulous! I love the color! Omg I love that suede jacket!! DON’T MISS: EASY STYLE WITH JEANS AND BELL SLEEVES JUMPER! The colors in this look are so beautiful together, and I’m in love with that jacket!! You look gorgeous! That’s a great moto jacket, I’ve really been wanting one in suede too!! Super cute pics! Loving the outfit but mostly the background.So so beautiful. Lovely!! I’ve added your blog onto the BLES Magazine Bloggerlist, congrats! This jacket is perfection! It can go with so many different looks!